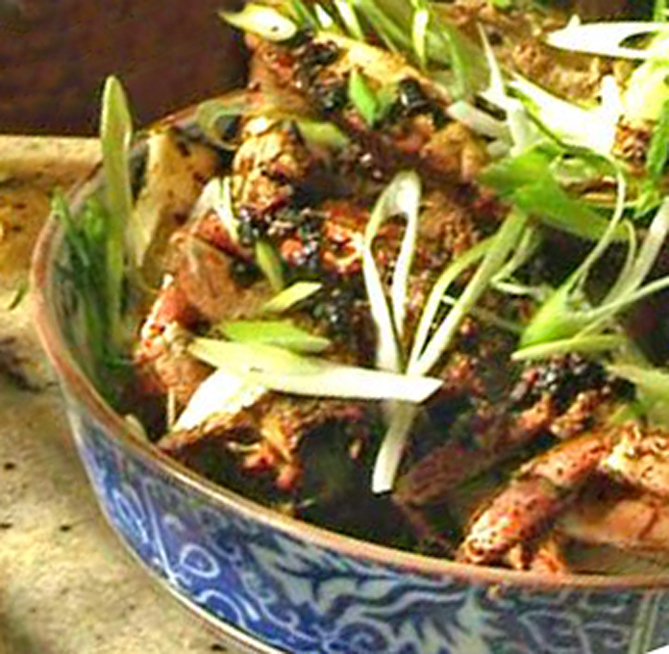 The ingredients in this crab recipe are quite similar to the ingredients in Steamed Crab Cantonese, but the cooking method is different – in this one the crabs are fried in a wok. You have all had this cooked with black bean sauce, but I have done it without too, when it is almost unrecognisable as the same recipe. You must have a lid for your wok for this recipe. (You should have one anyway.) The quantities given here are for one mud crab or approximately two sand crabs. Have all ingredients ready and at hand before you begin. Heat wok over high heat until hot, add oil, swirl; add ginger, garlic, then fermented black beans or black bean sauce if using either. Stir quickly for 30 seconds. Add crab pieces, splash in the rice vinegar or mirin and stir a few times as it steams up, turning the crab pieces to ensure they are well coated with the hot oil. Add soy sauce, stock or water and the pepper. Even out the crabs in the wok, cover and steam for 4 minutes for sand crabs, longer for mud crabs, the time depending on the size of the claws. When you think the crabs are almost cooked, uncover and stir well. Lower the heat, give the cornflour and water a good stir and pour it into the sauce. Add sesame oil and stir until the sauce thickens. Then pour the beaten egg over the crab in a circular motion, remove from heat and let the egg flow into the sauce. Remove to serving platter and serve immediately with shallots.